Just popping in to thank you all for your prayers for my husband and family this week. He had surgery Monday morning and it went well. It has been a rough week for us, but he is doing much better and will get to come home today. We're so happy and thankful - I just can't contain my excitement! Have a great Saturday, everyone! I haven't crocheted at all today. I'll have to get my project out in a bit and work on it. I really wanted to have all the small strips finished by then end of today, but I think I'm going to have to give myself until tomorrow or Friday. I picked up a good book and just couldn't put it down - so now I'm behind on my crochet schedule. Oh well - no biggie. It'll get done eventually. I've been getting more nervous about my DH's surgery on Monday. I'm okay until I think about him staying alive because of machines - even for just a short time. I'm so praying that God guides the hands of the surgeon and all those in the OR on Monday. A sweet friend is planning to come to the hospital and take our 3 kids out to lunch that day. They will appreciate the break from waiting, I'm sure. They're 11, 14, and 16 - and have all expressed a desire to be in the waiting room. I'm not about to tell them they can't be there... Anyway - on a brighter note... I got some new yarn this week that I can't wait to start working with. It's so pretty! Gotta. Get. This. Project. Done. First... (I'll keep telling myself that...) Ha! Another crazy week... I may be relegated to weekend computer time here pretty soon. I will pledge 2 squares to our queen this month. Congrats, owlvamp! Looking back in my patterns............. It is the Nosegay Square designed by Priscilla Hewitt. The pattern is for a 6" or 7" square so I added rounds of dc to bring it out to 12". I liked the way it turned out. I'm glad you like it, AngelFairy! I was afraid I had missed this swap! Life has been so crazy trying to get ready for my first year of teaching... I forgot to come sign up! I just saw that the survey deadline is tomorrow - so I made it just in time. WHEW! Sending my survey now. Cathoms ~ I am so sorry that it has taken me so long to say thank you! I love the square. My camera is acting up and my phone is dead so no picture right now. Hopefully I'll be able to post one soon. The color of the square is perfect - and thank you for the extra yarn!! Well - no keys today, mainly because they don't know where they're going to put me. There is a new building being built at the school and if it isn't finished before school starts, then we'll have to change rooms mid-year. They know where I'm moving TO but not where I'll start the year. Hopefully I'll know something by the end of the week. Thank you all for your Congratulations! I'm so excited. I loved seeing the picture of the new member of the Royal family! He's a cutie - and the three of them make a sweet looking family. 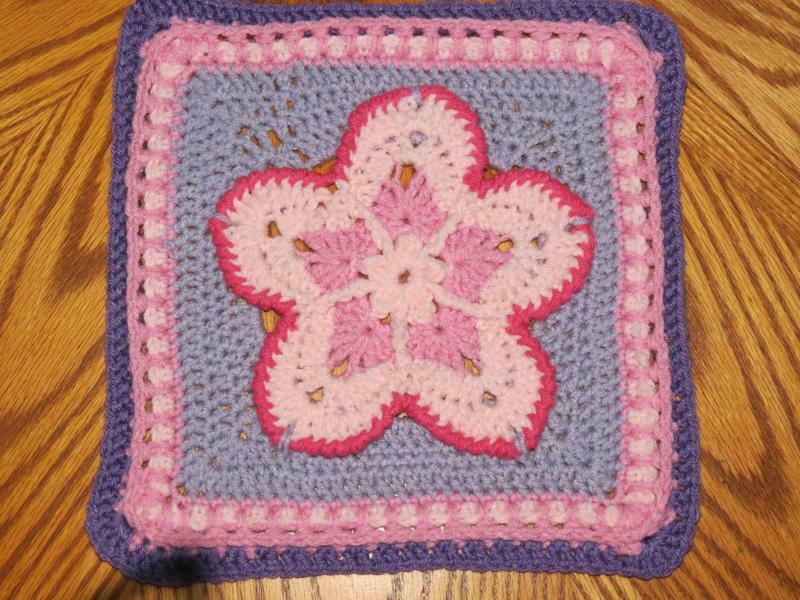 FRIENDSHIP GRANNY SQUARE afghan, thanks to all that helped! I see some of my squares!! Your afghan is beautiful - all the different colors work perfectly together! Soooo pretty. If I'm completely honest, geometry wasn't my favorite math either. I had it in the 9th grade and getting the hang of proofs was frustrating to put it mildly. However, now that I've had some of the classes that I had to take in college to get my degree in math, geometry proofs and writing proofs in general makes more sense to me. And keep hoping for those kinds of students - but don't hold your breath! LOL I've wanted to be a teacher since I was in the 4th grade (about 10 years old). The year that I was in the 4th grade was the year that the old copy machines that used blue ink and had to have time to dry were replaced with the newer versions that we're used to. (Black ink that dries almost instantly) She had TONS of worksheets that were copied in the blue ink. I stayed late on the last day of school to help her clean up in her room (yeah - I was that student) and as my reward, I got sent home with a big box FULL of worksheets. Needless to say, my stuffed animals and dolls had a proper education that summer! As for paying for the training ~ I'm going to be paying back student loans for a while. Thankfully I'll be able to get some of them forgiven if I teach in a low-income area school for five years. That will be a huge help. Speaking of teaching, I'm headed off to the school today to work with another geometry teacher on lesson plans and whatnot. I wonder what the chances are of me getting the keys to my classroom today. I want to decorate so badly!